The European and US space agencies (Esa and Nasa) have taken a significant step towards teaming up to explore Mars. 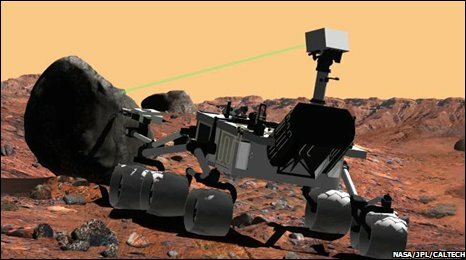 They have announced a joint initiative for robotic exploration of the Red Planet following a two-day summit in Plymouth, UK, last month. But this means European space ministers now face tough decisions over the future of Esa's ExoMars rover mission. They need to decide whether to totally re-scope ExoMars in the light of new options opened up by the collaboration. Nasa and Esa have been eyeing a mutual arrangement on Mars exploration because of the growing cost of such missions and because of shared science goals. The new plan is called the Mars Exploration Joint Initiative, or MEJI, and will investigate collaborative activities between the agencies for launch opportunities in 2016, 2018 and 2020 (launch opportunities to Mars come up roughly every two years). Nasa and Esa envisage sending landers and orbiters to conduct astrobiological, geological and geophysical investigations on the Red Planet over the coming decade. The ultimate goal of the collaboration is an international mission to bring back geological samples from the Red Planet. Speaking to BBC News on the eve of the Plymouth talks, Nasa's associate administrator for science, Dr Ed Weiler, said: "We have very similar scientific goals, maybe we ought to consider working together jointly on all our future Mars missions, so that we can do more than either one of us can do by ourselves." He said the talks would see if Esa and Nasa could come up with a "western hemisphere Mars programme". The US space agency's delegation to Plymouth was led by Dr Weiler. They were joined at the table by an Esa team headed by Professor David Southwood, the European agency's director of science and robotic exploration. In order to have launched the ExoMars mission as it was previously envisaged, Esa would have needed up to about 1.5bn euros. 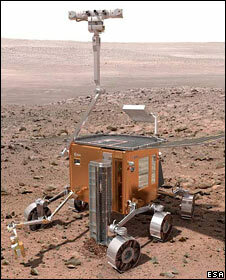 The rover is currently expected to launch in 2016, and will scour the Martian surface for signs of past or present life. But last year, following a process where space ministers indicated what they could subscribe, Esa's director-general Jean-Jacques Dordain promised European governments that the cost of the project would be kept as close as possible to the resulting total of 850m euros. Esa officials believe the way forward is through collaboration with the US, which is now expected to make a major investment in the mission. Under one scenario which has been discussed, America would supply a launch rocket, a carrier spacecraft and an orbiter to accompany the European-built rover to the Red Planet in 2016. But other possible options have emerged since the bilateral agency talks in Plymouth. These might see just an orbiter being sent to Mars in 2016 and then two rovers being dispatched to the surface in 2018. Dr David Parker, director of space science at the British National Space Centre (BNSC), said: "The UK is very supportive of Esa and Nasa getting together. "We feel it makes sense in the long term to minimise duplication of effort in terms of, for example, the number of rockets you need to buy to do Mars exploration." Dr Parker, who is also chair of the International Mars Exploration Working Group (IMEWG), added: "Nasa has the goal of launching an orbiter in 2016 to focus on the methane that was discovered by [Europe's] Mars Express [satellite]. "If there's a way of Europe being involved in following up the Mars Express findings... that would be very exciting because the methane either implies geological activity or something else even more dramatic. "In terms of the UK interest, we really want to make sure there is a sophisticated rover with a good set of life search instruments. That remains our key priority in the UK." As plans develop, they will be reviewed by Esa member states for approval and by the US National Academy of Sciences. If ExoMars were to be re-scoped, there could be important ramifications for European industry, as contracts for developing elements of the mission are already in place. And if financial contributions to the mission from Esa member states were to change substantially, the space agency might have to re-visit the balance of industrial work allocated to different countries through the process of "juste retour". Esa's rules of juste retour ensure the work which returns to a member state reflects the financial contribution it makes to a programme. In return for the US investment in ExoMars, European money would be put into future Red Planet missions. America has its own concerns: Nasa is having to plan ahead with reduced money for Mars exploration, and, like Europe, is keen to discuss sharing the cost of future missions to the Red Planet. Nasa is due to launch a $2.3bn nuclear-powered rover known as Mars Science Laboratory (also called "Curiosity") to the planet in 2011. MSL was previously to have launched in 2009. However, technical difficulties forced Nasa to delay the mission by two years, adding about $400m to the cost. In addition to the MEJI venture, the agencies agreed to establish a "joint architecture review team" to assist both sides in planning the Mars mission portfolio.